Whether you install ceramic tile over a slab, plywood subfloor or directly over an existing floor, you should always make sure the surface has been cleaned. All cracks and voids need to be repaired prior to the installation of a tiled surface when the tile is being directly bonded to the concrete. Cracks in the slab mean you will get problems later down the road if you don't do anything about it. There are many "crack suppression" products available on the market. However, if the crack is structural (with a height difference from one side of the crack to the other), you should consult a specialist because crack suppression products might not be enough. The best choice depends on the severity of the damage. In extreme cases, it might even be best to remove a large section of concrete slab and replace it with a new one rather than patching all the cracks. NEW CONSTRUCTION: it is important to let the slab cure. Allowing the slab to age a while will allow cracks to occur if they are going to. Then they can be dealt with. Concrete can deform or crack for a year or even more. The industry calls for a minimum 28 days curing time before any flooring should be installed. If you are concerned about cracks, you may want to have an isolation system installed onto the slab to seperate/detach the tile from the slab. The first product that comes to mind is a product called DITRA. 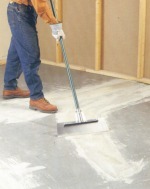 This will eliminate the possibility of slab cracks being transmitted into your tile job. DITRA is a plastic product that attaches to the slab with thinset, it is constructed so as to allow movement in the slab while not allowing this movement to be transmitted to the tile. You can still bond tile to concrete slabs with thin set mortar. It's not the best thing that can be done, but your budget might not permit a membrane application over the entire floor (DITRA will cost about $2.00 to $2.50 per square foot installation included). Chemically treated cement slabs are unsuitable surfaces to install ceramic tile over (curing compound is sometimes used to slow down water loss as a means of enhancing the curing process). Curing compounds on concrete slabs prevent bonding. To check the slab for the presence of such a coating, drip a few drops of water on its surface. If the water beads, it's highly likely that a coating was applied. More detailed information can be found here (National Floor Trends Magazine). Wood framing needs to be structurally sound and be able to support the installation. Tile floors are heavy and need a surface to be applied upon. 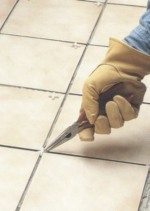 Tile is hard and will break or dislodge if the surface bends under the load. Or use John Bridge's deflection calculator. Remember that you need a very flat surface to work on. If needed, sand the plywood down and make it smooth. 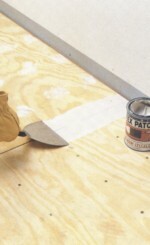 Plywood must be installed over an adequate subfloor and be at least 1 1/8" thick when combined with the subfloor. 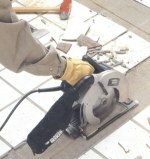 Interior-grade plywood and particleboard are not considered a strong enough floor underlayment. 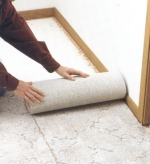 In bathrooms, it's a good idea to apply an isolation membrane over your wood subfloor. These membranes are thin rubber-like materials that will protect the tile from the expansion and contraction of the wood subfloor caused by high moisture, temperature and humidity changes. You've got 2 choices: leave the tile floor in place and thinset directly over it, or remove the tile with a hammer. If the existing tile floor is set over a mortar bed it may be hard to remove the tiles without removing a lot of the mortar bed. It really depends on the job. You might be able to remove the tiles without damaging the mud bed. If the bed is not very flat, you can compensate with thinset, but remove high spots first. If you tile directly over tile... check the height of the floor with the height of doors and cabinets. Rough up the existing tile with sand paper. Any good thinset like Versabond (Home Depot) will work fine to install your new floor. Try to remove the vinyl floor and the adhesive used for the vinyl installation. If it turns out to be difficult, you might want to lay down a backerboard with thinset. A backerboard like Hardibacker may be installed over vinyl. In some cases, you will be able to remove the vinyl itself, but not the adhesive. Use the type of thinset that is recommended by the backerboard manufacturer. 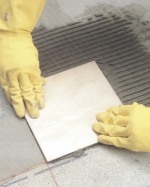 Make sure all loose adhesive is removed from the surface and verify that a good bond to the substrate can be achieved. For cut-back adhesive residue, verify that the thin-set manufacturer's mortar is compatible. If you are concerned that your vinyl floor may contain asbestos, you should have it tested before attempting to remove it. Many vinyls installed about 1982 or earlier may contain asbestos.